Over at Slate, the argument is made that Three Days of the Condor should sit up there with Die Hard on the list of alternative—but pretty cool—Christmas season movies. Christmas remains in the background throughout, playing a supporting role, but it’s as important to the film’s overall impact as Tiny Tim is to A Christmas Carol. It makes itself known through three popular carols: “Good King Wenceslas” lingers behind Joe as he’s reporting the murder of his colleagues; “Joy to the World” plays in concert with the electronic soundtrack of hospital equipment; and carolers sing “God Rest Ye Merry Gentlemen” over the film’s final scene. 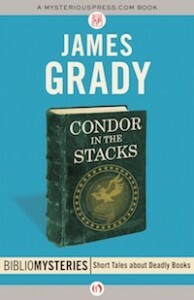 And once you're done with that, pick up Six Days of the Condor by James Grady—the book the movie was based on, which we've made available in paperback and eBook. The Mysterious Bookshop also offers a Bibliomystery, Condor in the Stacks, in print and eBook, too. Click the covers below to find them!